I do check Town Hall websites, County Government websites but State Websites might be a good idea too. Some holidays are regional or by state so this is important. If I had done a better search I would have moved my travel up a few days in the beginning and left New England earlier than the 24th of April…??? I was able to work around it and that was good. This was a big trip to prepare for! Time to leave the Chester Bulkley B&B in Wethersfield. It is very quiet here. As I work on my computer I watch the sun set over the spires of the building across from the house. 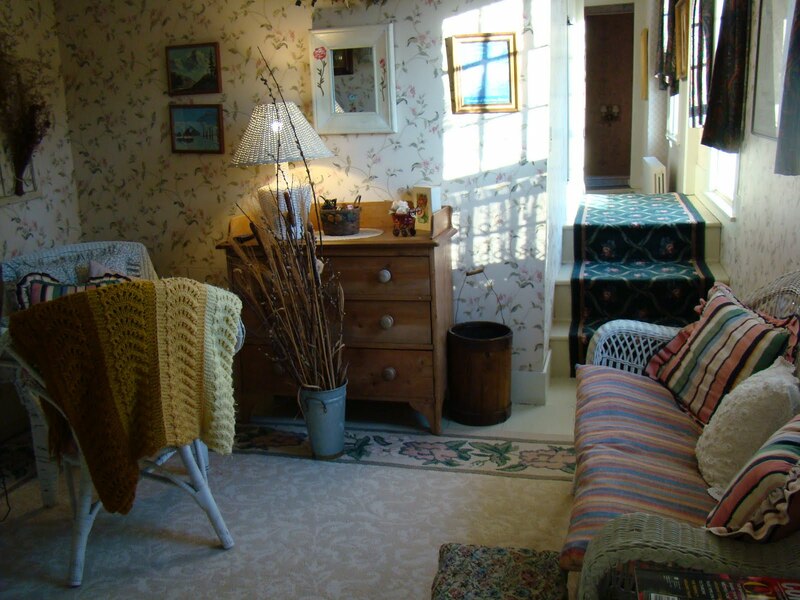 I like my little sitting room They have white wicker furniture in it and it is light and sweet with nicknacks here and there and litle foot stools. The house was beautifully decorated. My bedroom was roomy and the bed was inlayed wood with a rounded head on both the foot and headboard. It was very lovely. Very comfortable. I like the lavendor doors. His garden was just about ready to burst. I watched night fall through this window, lovely spires to look at! My host was a young man who purchased the house and runs it on his own. He said he had decorated some of the house. This host was quieter but he was a good cook. I ate the omelette he made the day before and it was good. I usually don’t eat omelettes but I ate the whole thing! My breakfast was waffles with these peaches on it and it was good too. He did answer my questions and I did get a couple of laughs out of him but he was definitely quieter than the other hosts. He seems to think that gas will be $4 to $6 dollars in the summer and with the bad snowy cold winter tourism is down. I wish him and the other B&B owners luck and good fortune and I have excellent experiences in each place I have stayed this trip. 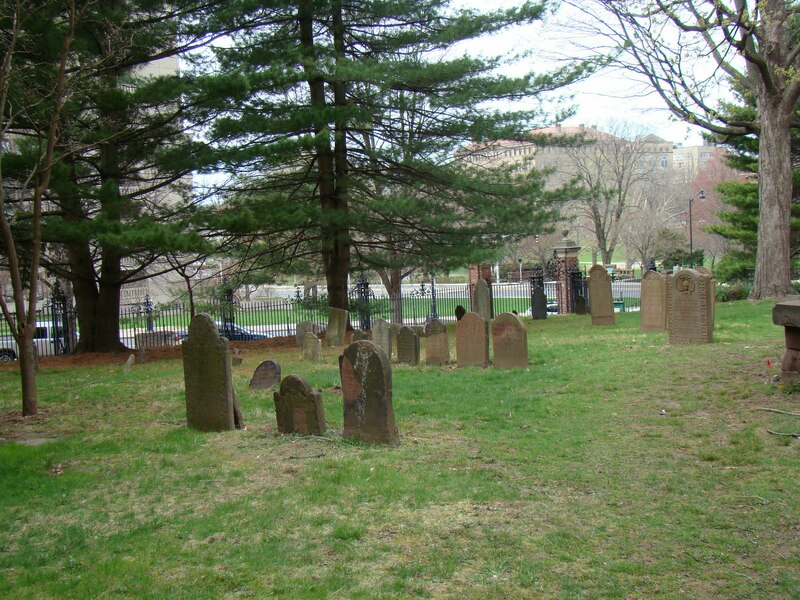 Today I am going to see the Ancient Burying Ground in Hartford. The librarian at CSL told me that I would probably have to park on the street or in a lot and walk to it. There is a church next to it. The individual that I am visiting is a 10th great grandfathr Andrew Warner. 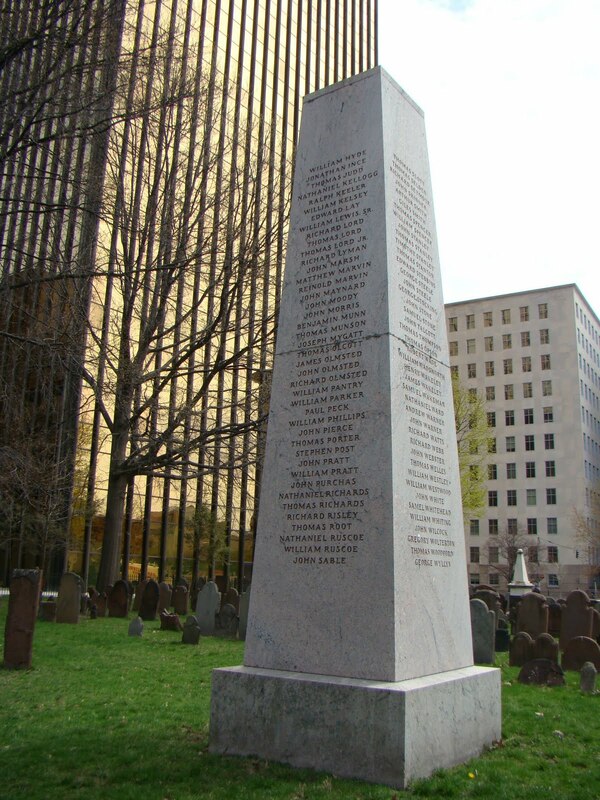 No one really knows where he is buried but he founded Hartford along with many others. He is a forbear of the Scott family? I have been so focused on the Goss family marrying into the Cooley’s, Wolcotts, Bliss and others that I have not investigated these other lines of my family which are old and founding immigrants to America. I am getting mixed information on this man’s descendants and a lot of confusion. There is a book about the descendants of Andrew Warner compiled by Lucien C. Warner and Mrs. Josephine G. Nichols, 1919 at Ancestry. Lots of good information in this book. I need to do more digging. I made my way back to Hartford and down Main St. stopping for gas and there were 5 police cars on the other side of the street. Awh city life! I past Capitol Ave and and spotted the church and the cemetery on the left. The cemetery and church are on Jewell or Atheneum St. I don’t remember if the streets were named differntly on each side? I turned left on Asylum two blocks north and parked in the lot on the corner. It was cold but partly sunny. There was wind. A Burger King was on the corner across from the Old State House. I wanted to also view the library and city hall but it was so cold even though it was sunny. Brrr…!!! I made my way down a couple of blocks to the church and started taking my photos. 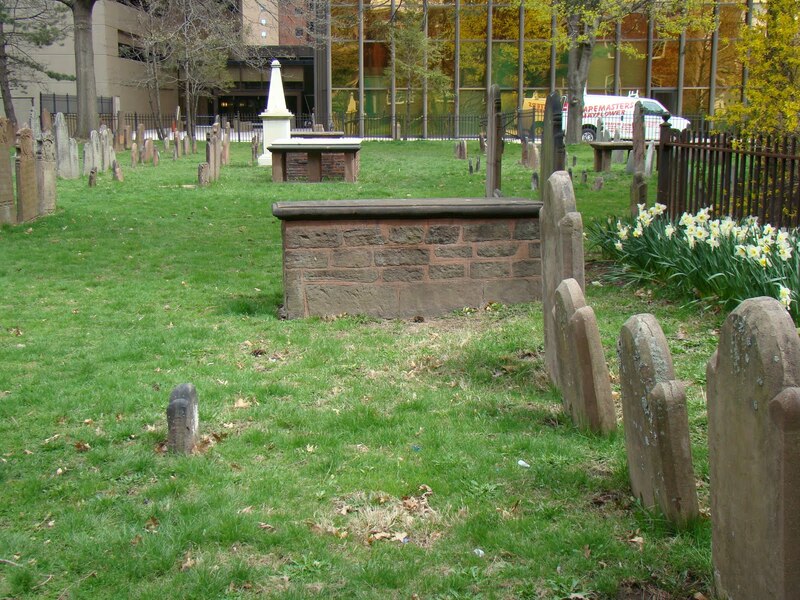 There is a gate on the right side of the church were the cemetery is located. 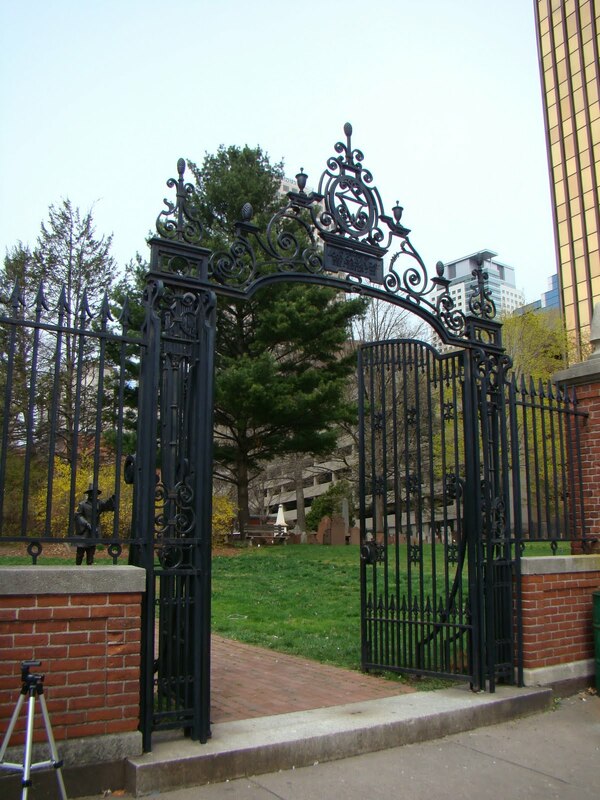 Several layers of iron fence surrounds it. 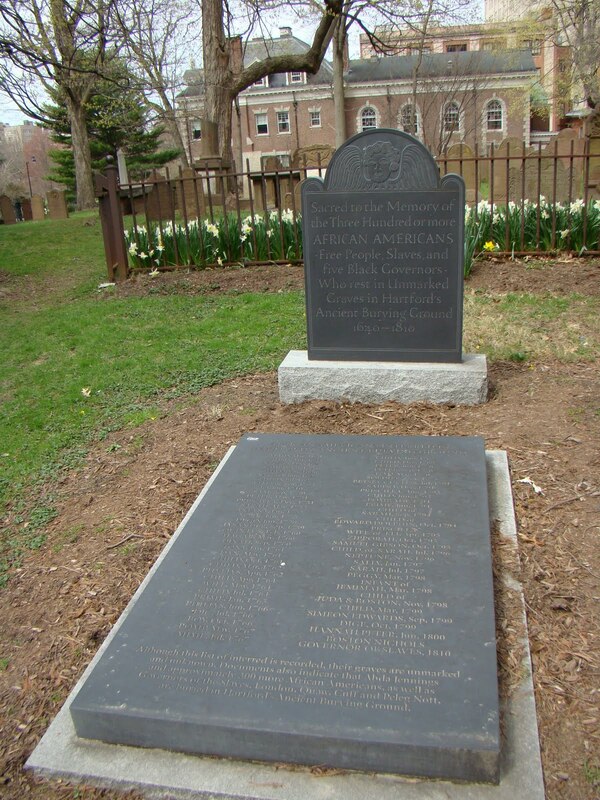 There is a very large monument and large rectangular stone in honor of the African Americans buried in this cemetery with no stones. They have tried to identify who is here. Daffodils are blooming along the edge. You enter the cemetery through the gate. Considering its age it is in very good shape. 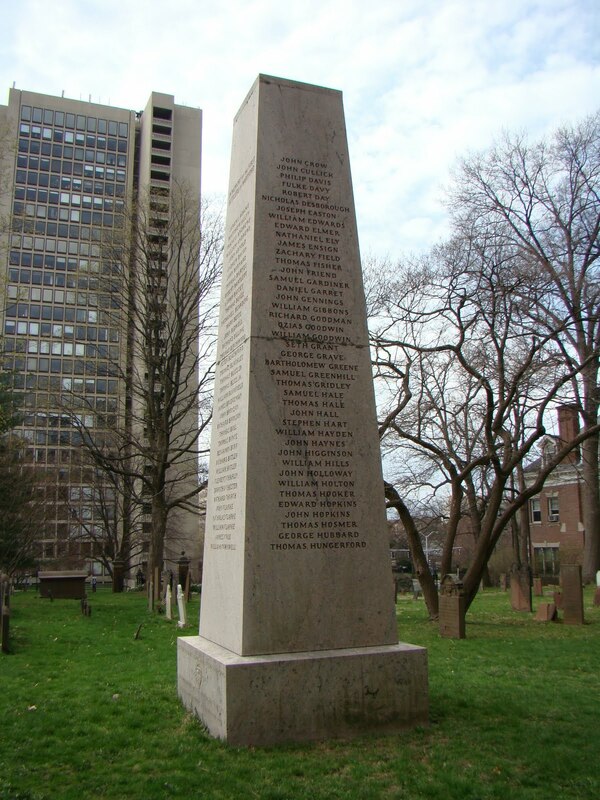 My ultimate goal was the big giant obelisk in the center. The names are alphabetized on each side. You just have to find the side of it that has the name you are looking for. I am pointing to Andrew Warner’s name. So the “A’s” start on the side to the right. You walk counter clockwise around it. I am afraid I don’t know a lot about this man and frankly I could be wrong! So I need to do some research on him. 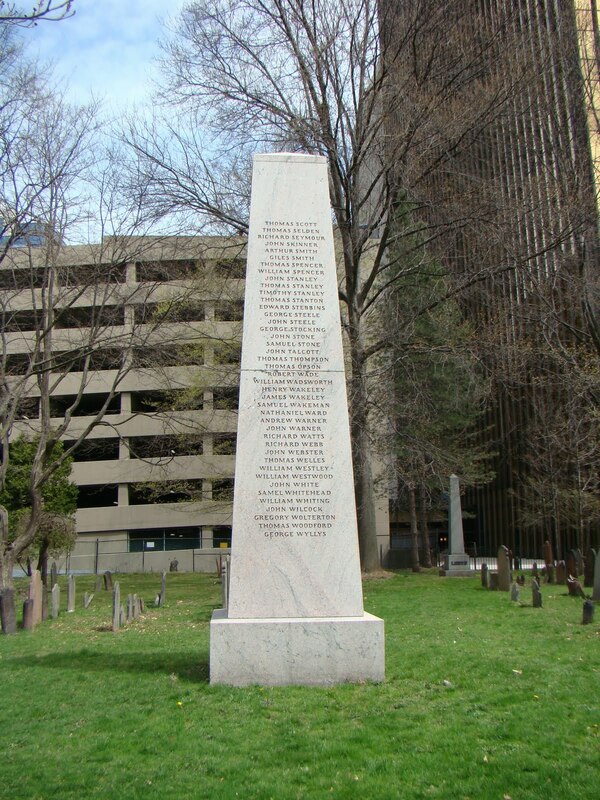 The point is that the names on this obelisk are founding father’s and it is important for all of us to at least take a look at the information. 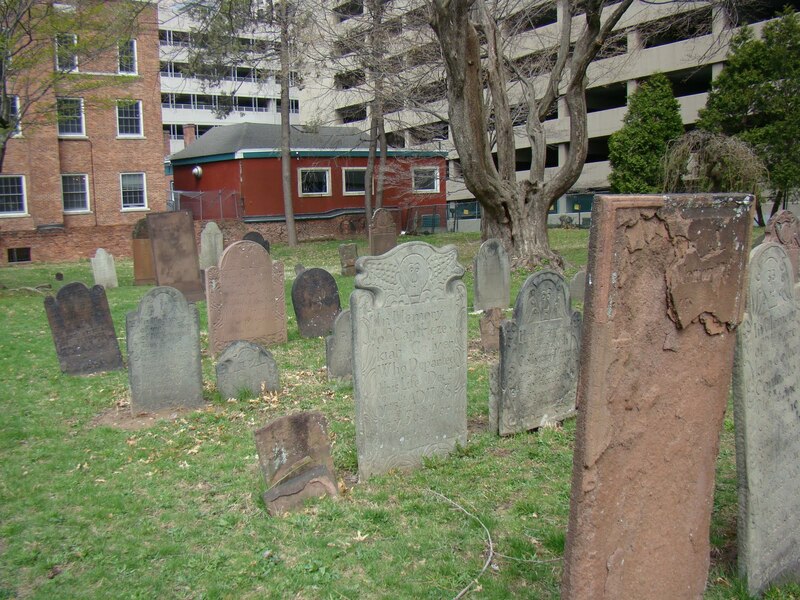 It was pretty awesome to visit this cemetery in the middle of this huge city surrounded by all these tall modern buildings. I was getting so cold I couldn’t stay any longer even though I had lingered and walked some of the cemetery reading names out loud. So I walked back to the Burger King as fast as I could. I bought a hamburger and some hot coffee and enjoyed it thoroughly. I also watched Hartford come and go. 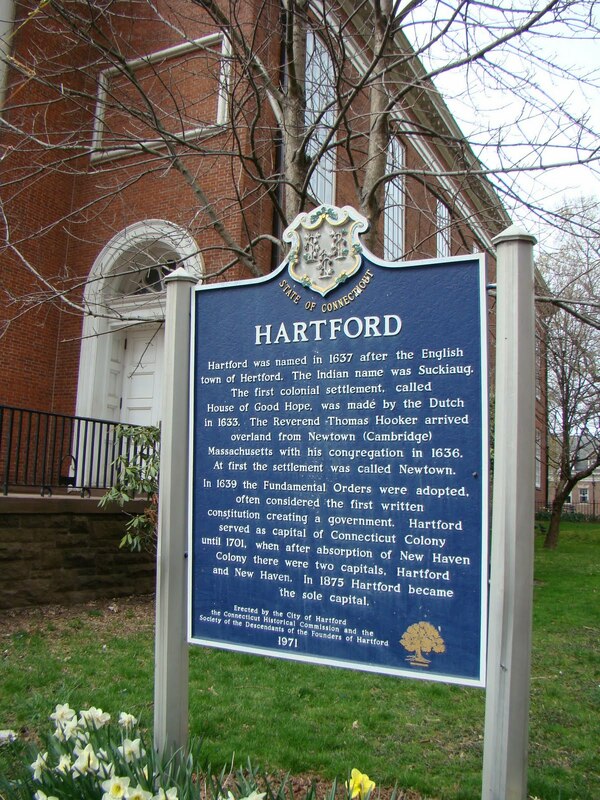 I had been to Hartford but only to the state library, the historical society and the fancy convention center. So just sitting and spending time in the center of the city was a fun experience. Now it was the Good Friday so it was probably a quieter Hartford in the downtown area. Several men were napping in the corner of the restaurant. A man sat across from me. He had a huge amount of keys on his belt. He seemed tired and he was in uniform for he had a label on his shirt. Once I was warmed up I returned to the parking lot. There was a vendor with their wares set out on the sidewalk. I paid my fee and turned right onto Asylum. I pointed the car west and off I went to the Connecticut Historical Society which is open 12 to 5 pm. Once you get on Asylum just make sure you stay right because the lanes do disappear and head west on this street till you get to Elizabeth Ave. then turn left and the entrance is right there on the left. You can’t miss the building for it is big. I had such a wonderful time there the last visit that I returned a second time. This was going to be my third visit. 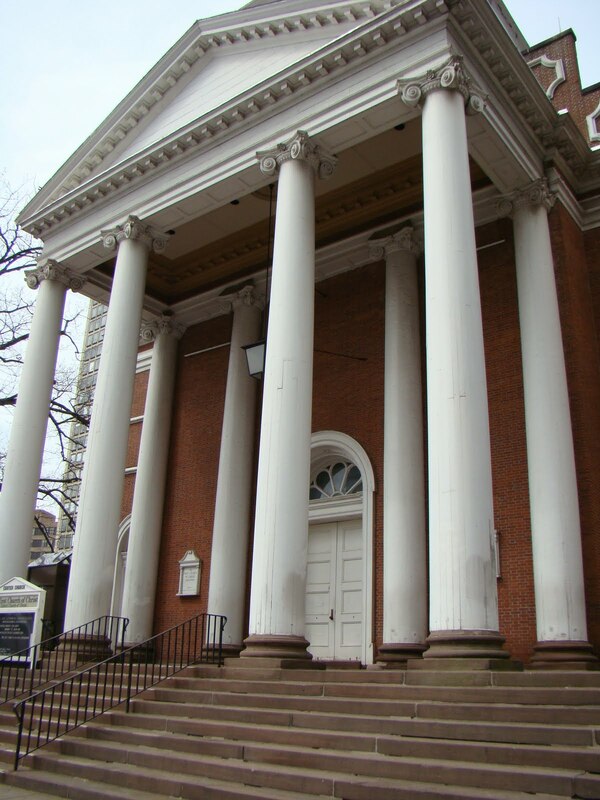 This society is located at 1 Elizabeth Ave. in Hartford. 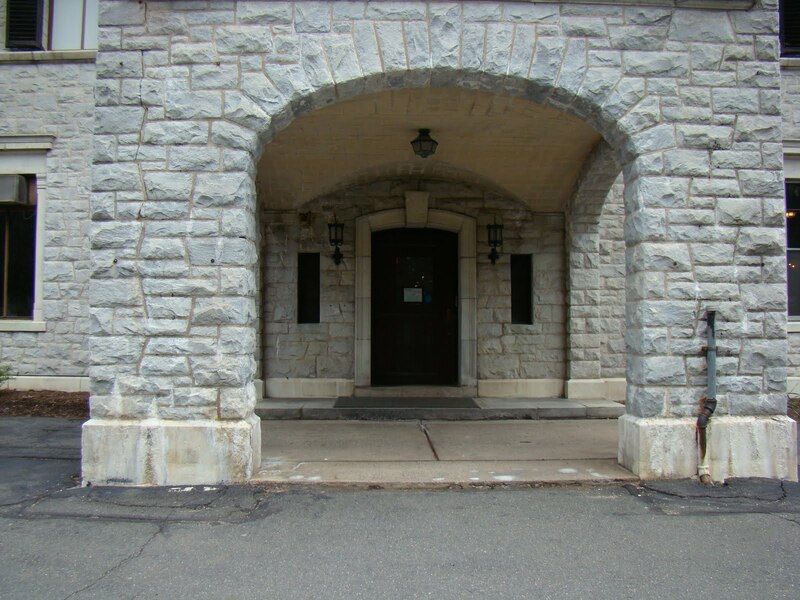 The photo above shows the entrance off of Elizabeth Ave. There is parking on the west side. I had looked at the website and studied the catalog and other finding aids but was not real sure what I was going to do. Since it was open even on a holiday, I decided to go there and see what trouble I could get into. I was greeted by the nice young lady that I had sat next to at the Friday night banquet a the New England Regional conference. She was very nice and helpful. Another lady was at the reference desk and she too had been at the conference. I am afraid that their names have escaped me. 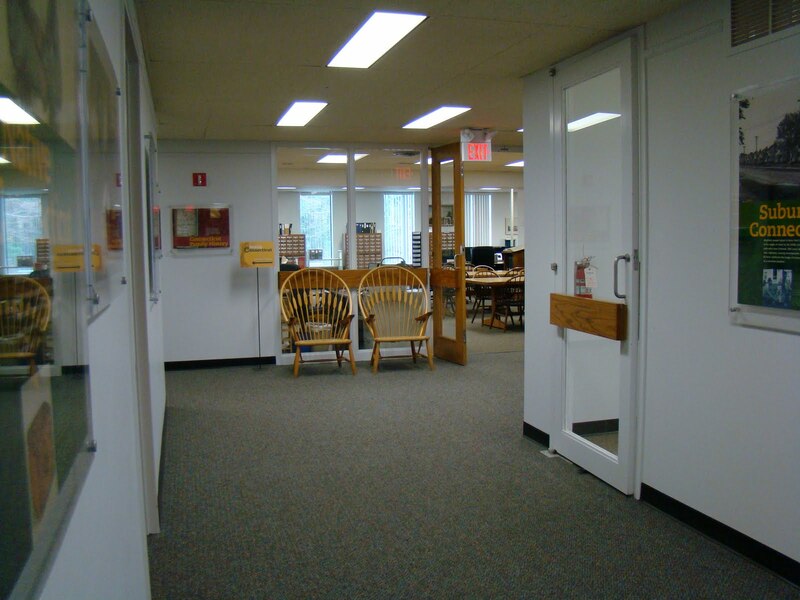 She was busy with moving microfilm and books and rearranging things so they could bring in more materials. Just know that all the librarians are very helpful and pleasant. 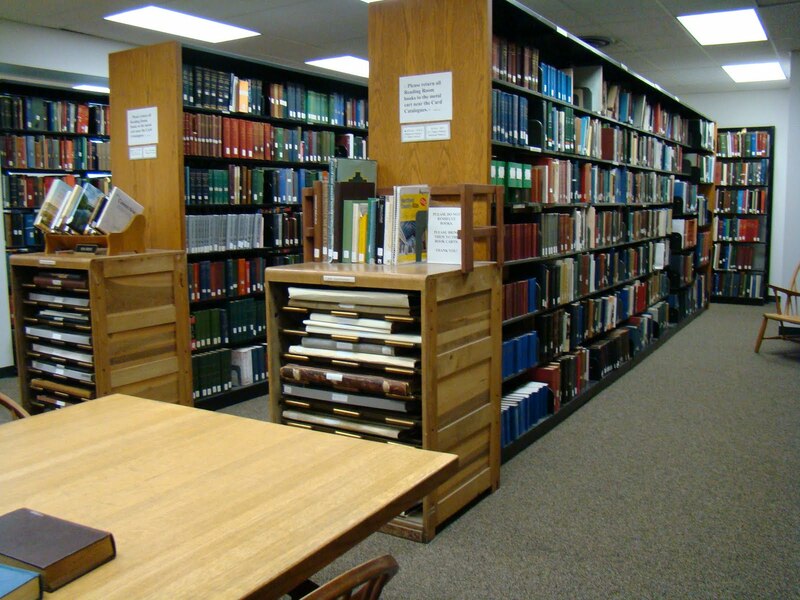 You can access many items in the research room but a lot of items have to be retrieved so you make your orders on the one order card and if you have any trouble filling it out you just ask the librarian and they help you. I revisited the Goss file in the manuscript card catalog and I didn’t find anything in it that I had not already studied and obtained copies of. Sure wish Donald Lines Jacobus would have signed his letters it would make it more special. They have WiFi so you can access that and it works wonderful. Ask at the desk for the code. 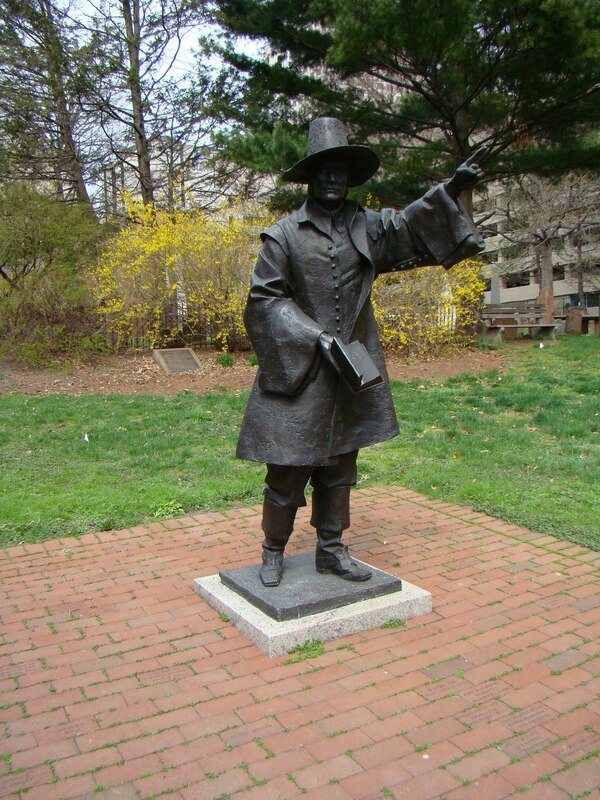 I ordered some old maps and studied Simsbury trying to see if I could find Simon Wolcott’s land in Simsbury. Do you think his treasure is still buried there? I wandered the stacks and pulled some books. This library is amazing so little time! It closed a 5 pm. So about 4:45 pm I packed up and said good bye and thanked the librarians and headed out. It is time to head north Simsbury. Philip Goss of Brookfield and Mary Kendall Goss were in Simsbury before they headed up to Granby, Granville and then Becket. Actually Philip’s land was in North Granby. 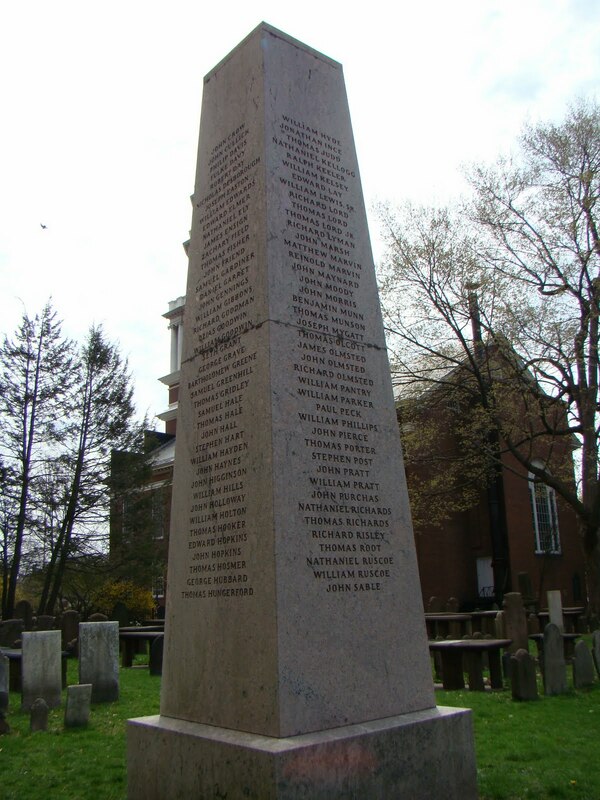 He had the births of some of his children recorded in Simsbury. 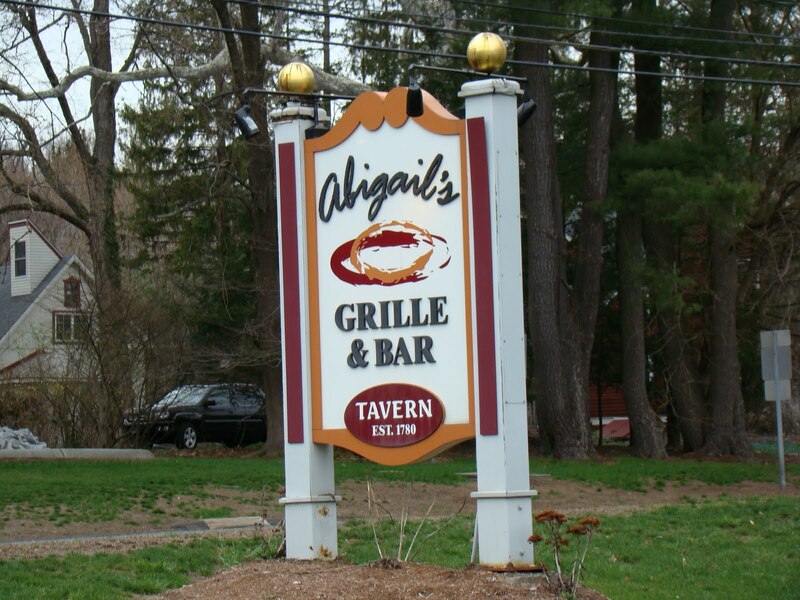 I had a reservation at Abigail’s south of Simsbury. It used to be Pettibone’s. They took me right into the dining room even though I was really early. I made good time and exited Hartford without too much trouble. My dinner was tasty and Abigail’s was very fancy. The area I was in seemed new so I was a little surprised and had expected something older! A family (mother, son, father, her mother) sat down across from me and was very intent on planning their meals. Apparently they had been there before. The husband was very handsome but very serious. It was clear the mother was the focal point of this family. 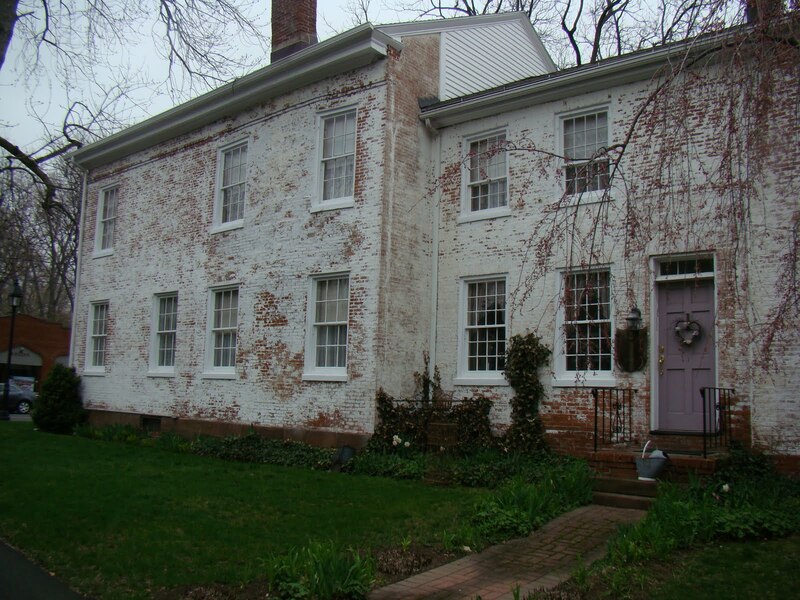 ﻿﻿I headed for the Simsbury House 1820 in the heart of Simsbury. I missed the sign and got honked at by acar on my bumper. Grrrr….! 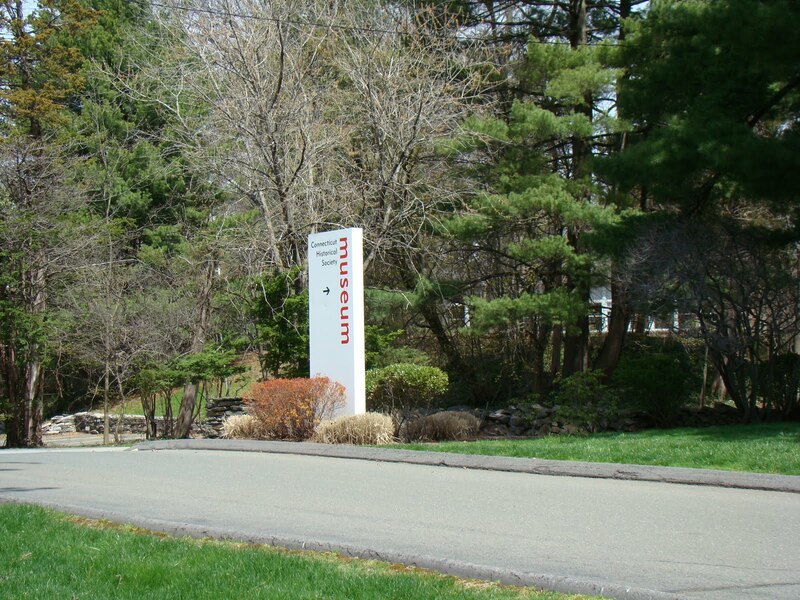 I found the Simsbury House by turning on Library St. and coming in from the side area. 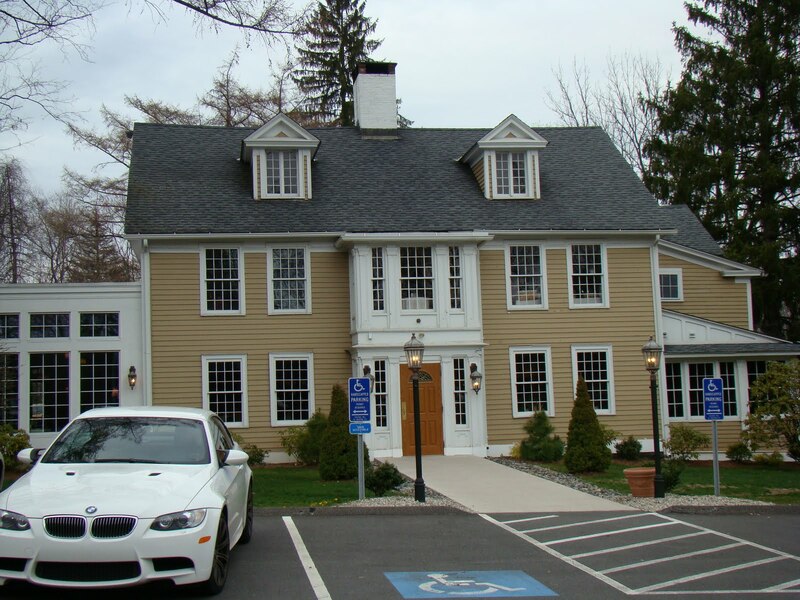 The Simsbury house turned out to be more of a hotel than a Bed and Breakfast. There is a big porch and the entry way into the foyer. The stairs are to the right and up to the second floor. My room was down the hall to the right and looked out over the parking lot. My plan was to empty the car and gather all my belongings to repack for the flight home on Sunday. That was two days away so I had some time to get things reorganized. It took 4 trips maybe 5. Once that was done I settled into the room. The room was a good size and had a wonderful desk with a view through the window. A bathroom was off the side wall. The walls were papered with toile in a light powdery blue and the curtains were a little darker hue but still in toile. I am providing a link for those who do not know their toile! I climbed into the big soft bed. A little TV, a little wine! Good night! I had a lovely room in the Chimney Crest Bed and Breakfast. This is a mansion. To the right is the living room and at the end is the sun room. The hallway has rounded archways in the windows and the curtains are also rounded at the top. To the left is the formal dinning area. The hostess is very kind, friendly and helpful. You almost feel like you have traveled back in time to another world. This house is the Barnes house. A prominent family in Bristol owned it. My room was comfortable. There was a desk and chair. It was lovely. The windows looked out on the circular driveway. 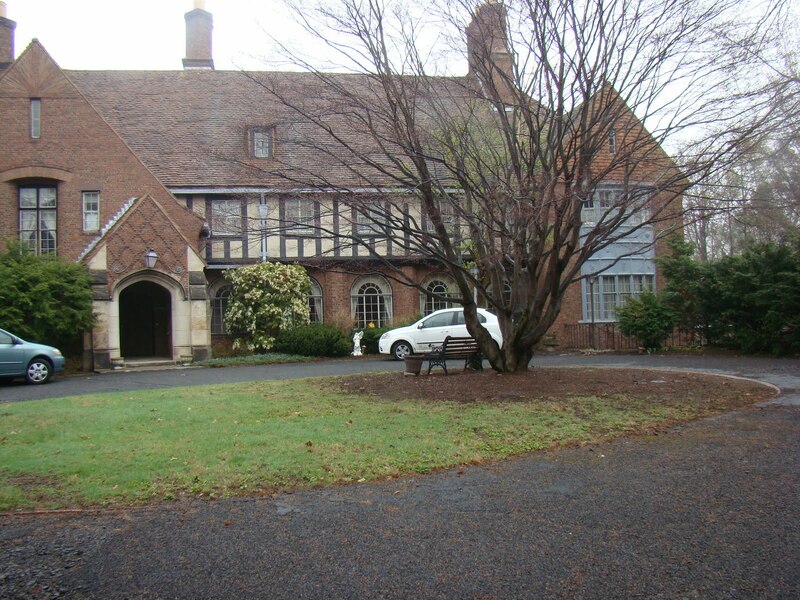 The house is a Tudor style. 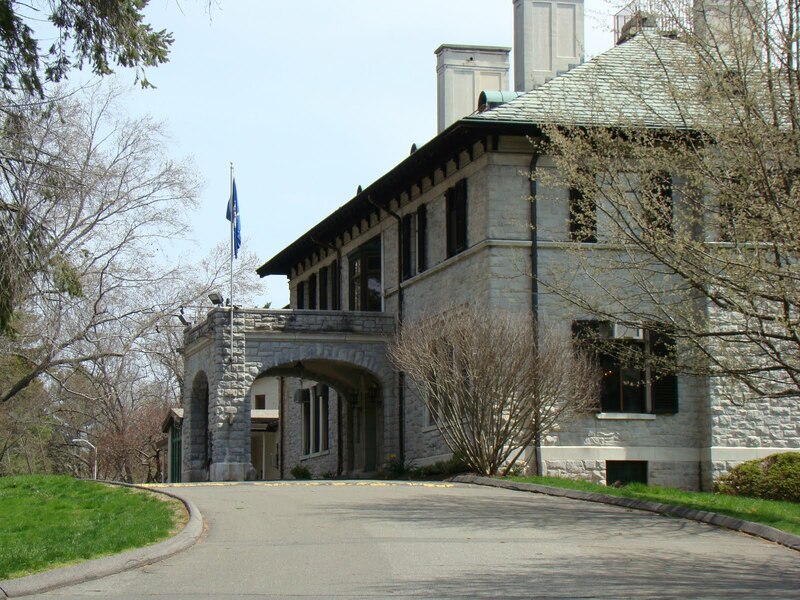 It is along Woodland Drive in Bristol near Paige Park. It is lovely. Just look for the brick pillars before you go down the steep hill. I told the hostess that I got up early and she provided a coffee maker with cream in the ice cooler with ice! Wow! How thoughtful. The breakfast was wonderful and the conversation with my host Cynthia was a joy. She asked me questions curious about my genealogy research. Apparently this house was her father’s dream. It was a mess when he purchased it but it is lovely now! She has taken on his legacy. This was truly happy experience. Just lovely! As usual I talked to much and had to head out on my quest for ancestors. My goal the Bristol Town Hall. Well I was told it was the white building but it was the building next to it! Now for some reason my sense of direction was messed up in Bristol. I was having a terrible time with were things were. Hmmm….am I getting too tired? 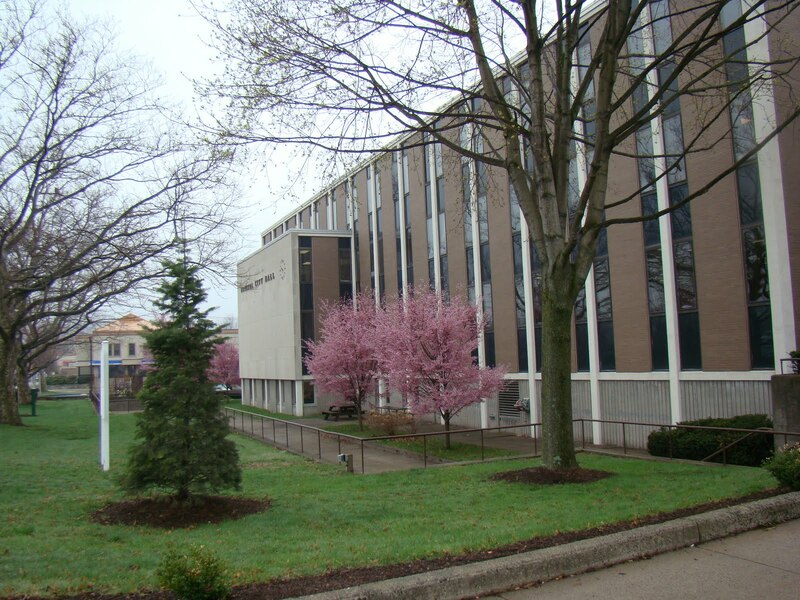 The Town Hall is located on N. Main St. between Laurel and Center Street. I parked on the street and I believe it is a 2 hour limit? So far I have had no problems in Town Halls with security or restrictions. 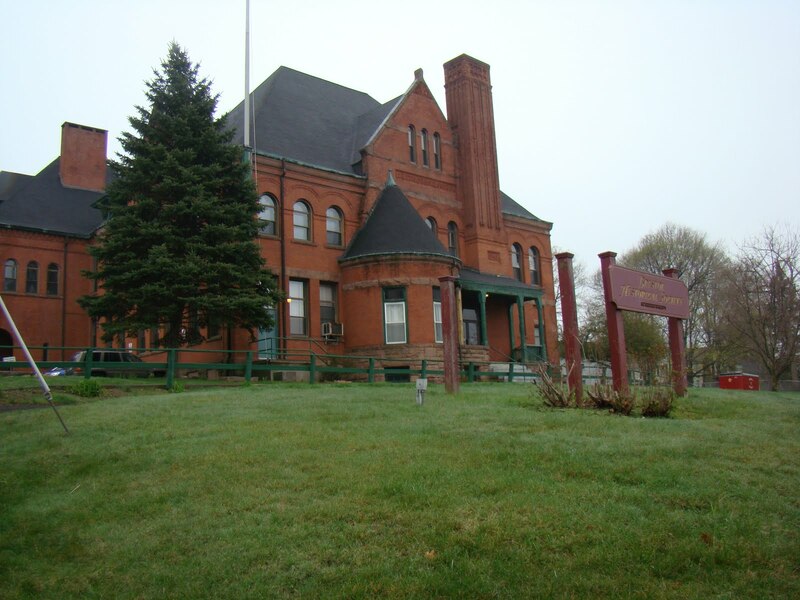 I had good experiences at the Enfield and East Windsor Town Halls. These two are in Connecticut and no problems in Massachusetts. Friendly and helpful people in all. Well…In relating this episode I do not want to reflect badly on Bristol. It was a charming town and I enjoyed my stay there. So far everyone had been friendly, pleasant and helpful. I knew about the privacy issues and the rules of becoming a member of various authorized genealogical or historical organizations. I investigated this before I came on the trip and decided I was within the law for the vital records and I would be okay. Well I was wrong!!!!!! I did not take into consideration that the indexes went beyond the legal requirements for birth into earlier than 100 years. I was going to look at births in the late 1800’s and deaths in the early 1900’s. I also brought my birth certificate, my dad’s information and my Barclay’s vital records to show that I was an appropriate relative. An assistant town clerk approached me and I explained carefully what I needed. I explained I wanted to see births in the 1850 to 1900 time frame. Deaths in the 1915 to 1920 time frame. She asked if I had a card. I told her I was a professional genealogist but I was with the Association of Professional Genealogists. I believe she showed me a list for Connecticut. Of course APG is not on that list. I told her and showed her the papers I had brought about my appropriateness as a relative. She refused to look. Somehow I did get lead into the vault area where they keep the land record books after signing a form and showing ID and she asked me about what I needed. I started with the deaths and apparently that was okay for me to see. Apparently she misunderstood and reversed them thinking I wanted birth in the 1900’s. I repeated what I wanted. I was brought an index and I found them in it. 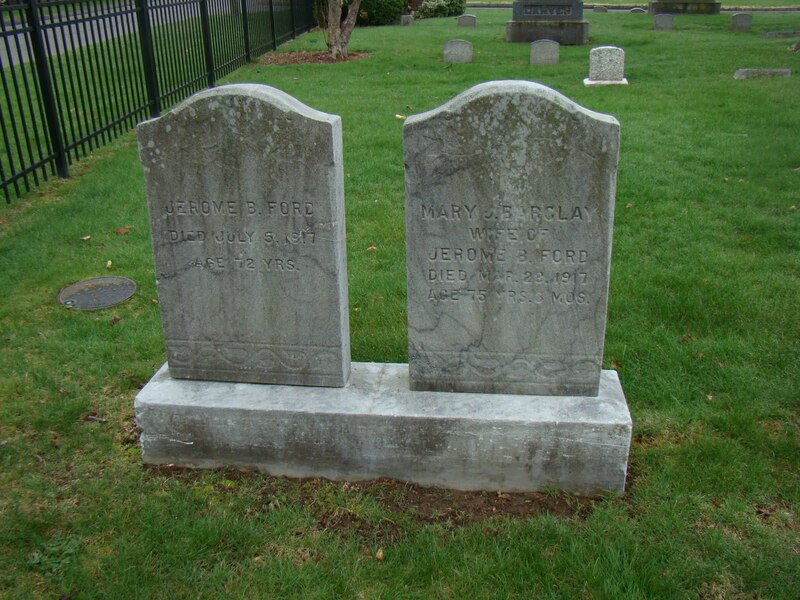 I asked for the books and found the death certificates for Mary J. Ford and Jerome Ford in the death records. I requested copies and was told that they would have to be certified. I told the clerk that I really didn’t need certified but that is apparently all they did and she said they “had to be certified” in a very strong tone. I said that I was just asking because some places give you a choice? I left to get some more money because it was $20.00 a copy for a each vital record. I had forgotten to do so prior. I also needed to get my computer to try to pin the information down on births so they, the clerks, would not have to work so hard. The vital records are in the back area in another room locked away. They can only retrieve so many at one time and it is a bit of a walk. Now I usually go into a vital records office prepared. I had my information on Mary J. Ford but not much on Jerome or their three girls. Even the obituary had not given me much to go on. It did reveal that the daughters had probably not been born in Bristol. When I returned with my computer and money the books were gone. The first clerk said not to worry and brought them back. “We aren’t suppose to leave them out!” Now when I left I did tell her I had to go out. They had me wait for the certified copies before they came to help any further. I took a deep breath and in as calm a voice as possible I explained that I didn’t live in Connecticut and didn’t know all the rules and was just trying to find out. She seemed to be a little better. I tried to remain calm and found it difficult. She was “stomping” around and rushing around. It was all very confusing. Another clerk who was tall and very nice assisted me when the first clerk went on break and she was very helpful. I gave her my best guess on the births and she pulled an index. I was not suppose to see this because it went beyond the time limit. It had birth, marriage, and death and I found the marriage of one of the daughters Lizzie to a Frank E. Yale and asked for a copy. Again I had to wait. This same clerk went in the back area of the large vault room and looked for births for Lizzie (Melissa) and others but didn’t find anything and announced this. I did not look at any books. I decided that I had about all I could handle. I did get two death records and a marriage and eliminated many things. I may have the maiden name of my great grandmother Margaret. I knew so very little of her. I also found where a sibling of great grandfather George A. Barclay was buried. 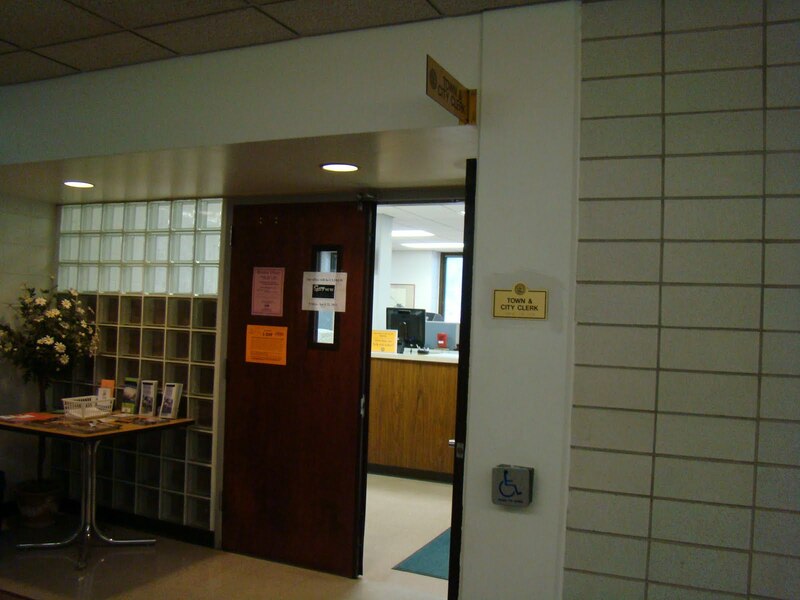 After I left the Town Clerk’s office I leaned against the wall in the hallway to get my whits about me. I was still shaking when I returned to my car and it took a long time to calm down. I was not angry just befuddled and frightened at the anger thrown at me and the hostility from this person. The other two clerks were trying to help. When I was at the counter paying for the copies she asked me if I wanted a receipt and I said yes please. She was helpful and pleasant. The first clerk would not look at me at all. Something was very wrong in this office and it is not the laws of Connecticut! It is difficult to share this experience because it reflects badly on a town hall and Connecticut. I have worked as a government employee and I know how hard it can be to work in this type of environment. Still, this is unacceptable to me to be treated in this manner. 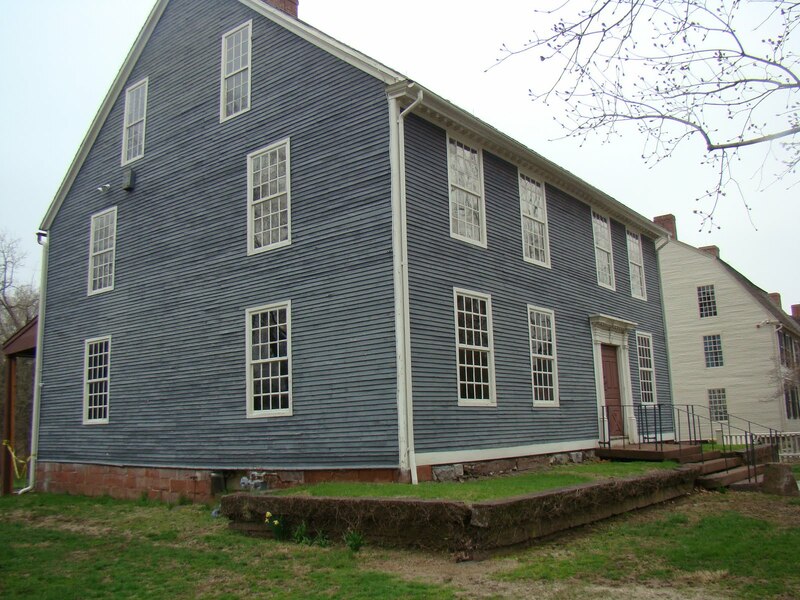 If you are planning on doing research in vital records in Connecticut learn from this experience. Realize not all town halls will be like this, Enfield was wonderful. I was looking at records in the middle 1800’s however. 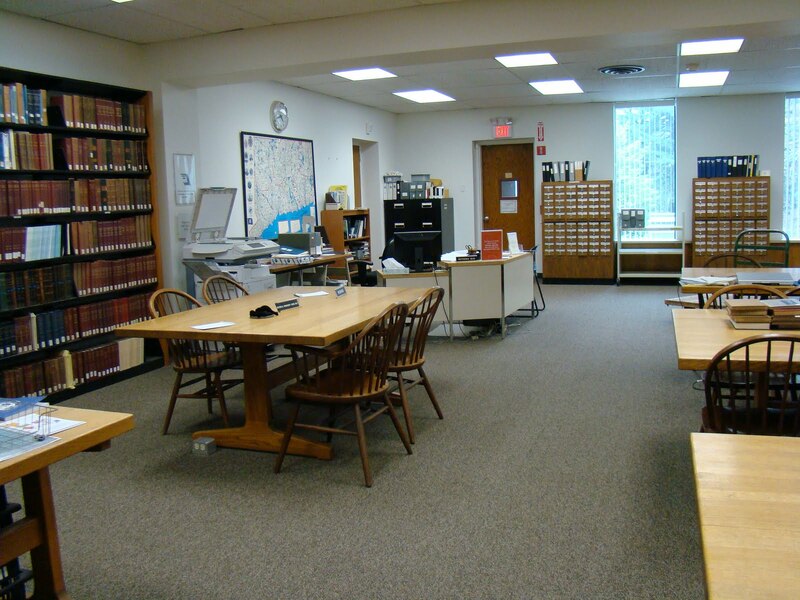 While in the vault room of the Bristol Town Clerks office I found it to be a good sized room, very neat, orderly and clean. It had along the walls these cabinets that held all these land record books with numbers on the side. I wandered a round a little reading titles and was promptly asked by one of the researchers if he could help. I said no I am just looking. I did not pull anything I just observed. It was a wonderful room but hardly any tables to work on. There were several researchers who knew each other but didn’t even acknowledge me. I was tempted to photograph the room but the other researchers would hear the click. I didn’t wish at this time to push my luck or cause further trouble. I believe there is a finding aid to the land records. On my way out of Bristol I was driving up Center Road and I spotted the Bristol Historical Society so I stopped and took some photos. As I was walking around several people came out of the building and I asked when they were open and this nice lady approached and we started chatting. We discussed my research about the Barclays and the Fords and she told me she would take a look. I believe her name was Lillian and she was very nice. 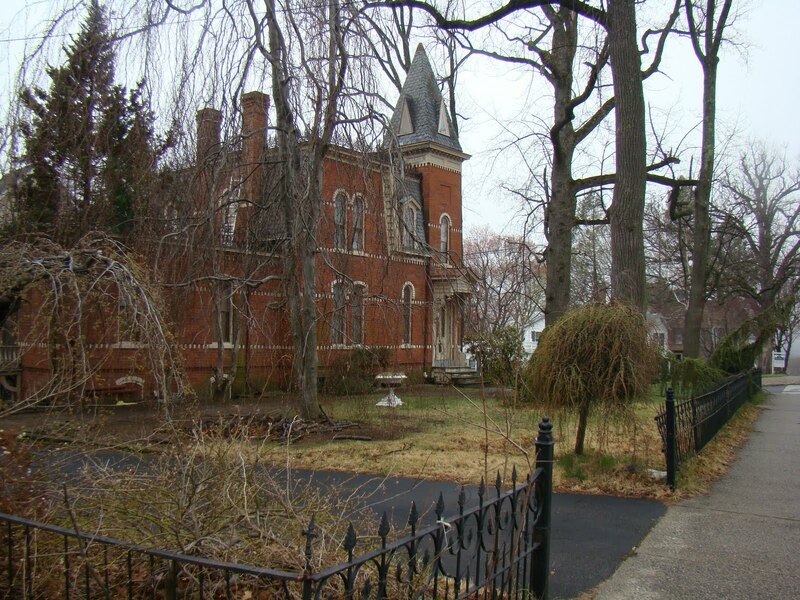 She knew about the Chimney Crest Manor belonging to the Barnes. It was a very nice exchange. 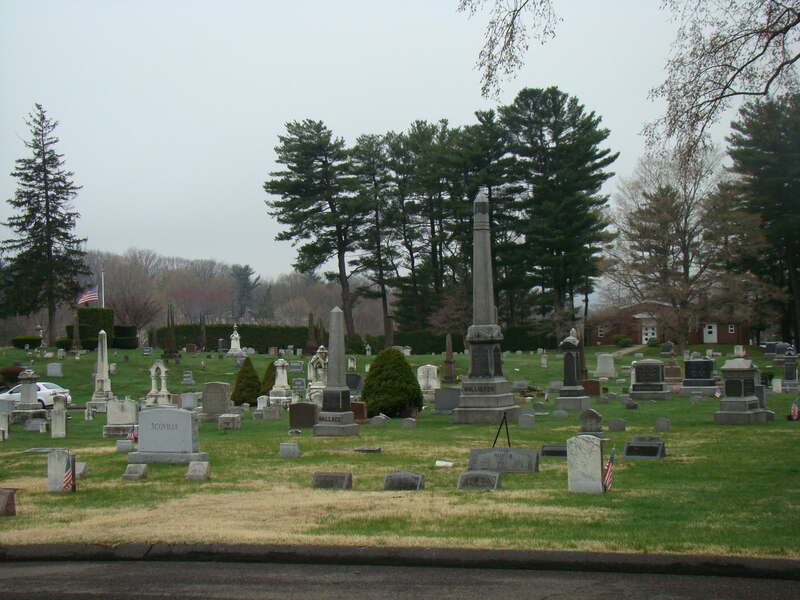 My very special goal was the Forestville Cemetery which was called the East Cemetery years ago. I was warned it was a big cemetery and was a little worried as to how I would find them. I was looking for Mary J. Barclay Ford and Jerome B. Ford and there three daughters. I knew about Mary J. from the estate file of my great uncle Alexander Barclay. 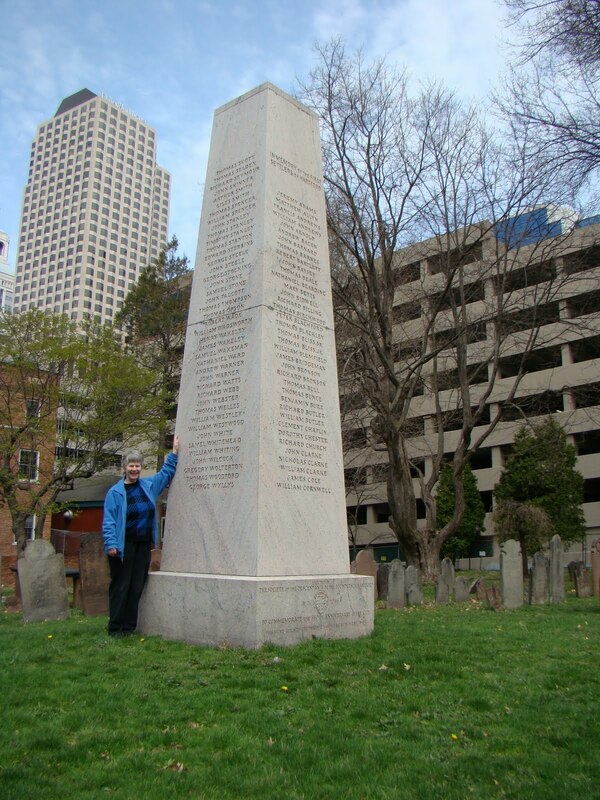 Mary and Alexander were siblings of my great grandfather George A. Barclay. I have been tracking her and it was exciting to know that I had an obituary for her and her husband. I need to study it all and do a post on my Barclays of Pine River blog. See link to the right of this blog under blog list. The Forestville Cemetery is on Circle Street in Forestville. I found it by going along W. Washington St. to Center and then to Circle. 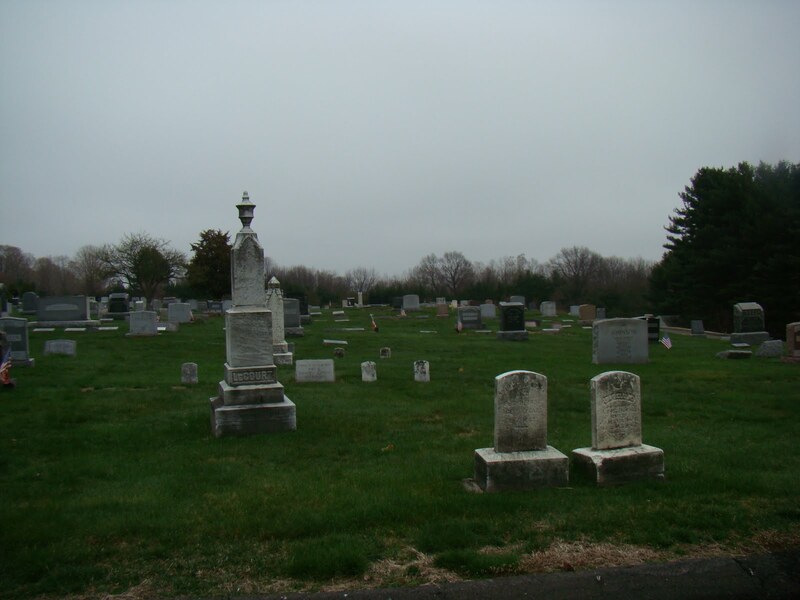 It is a very well kept cemetery and easy to get around on the paved roads which are numbered 1-4. 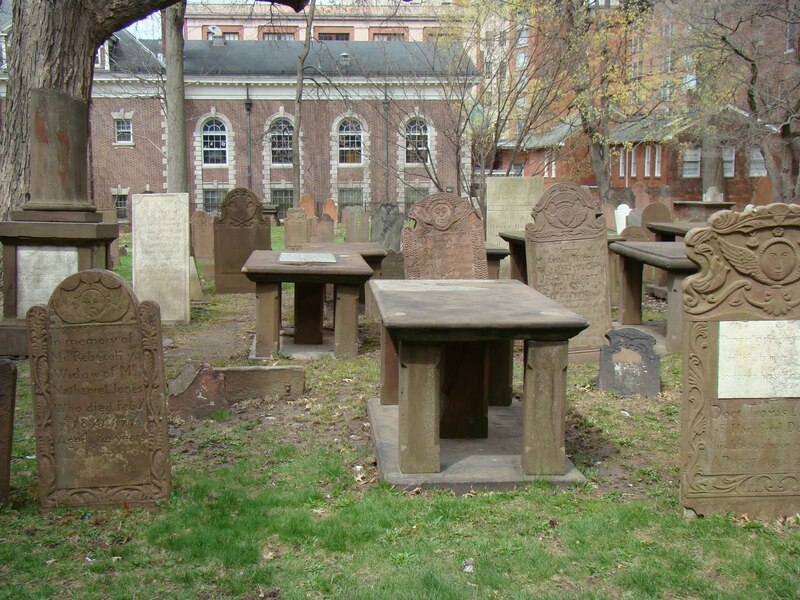 The information I had obtained from the History room in the Bristol Library gave me other names on tombstones to use to try to identify my family. They have a cemetery book with listings done by rows although the rows are not identified you can tell by the page number approximately where the graves might be. You could call the Forestville Cemetery Association. 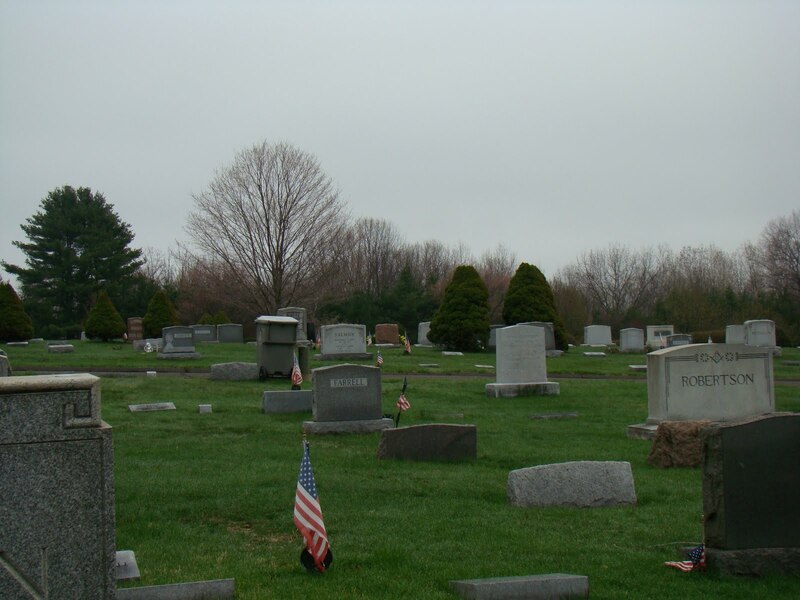 Most cemetery jobs are part time so you do have to be patient. I didn’t do that but decided I could figure it out myself. 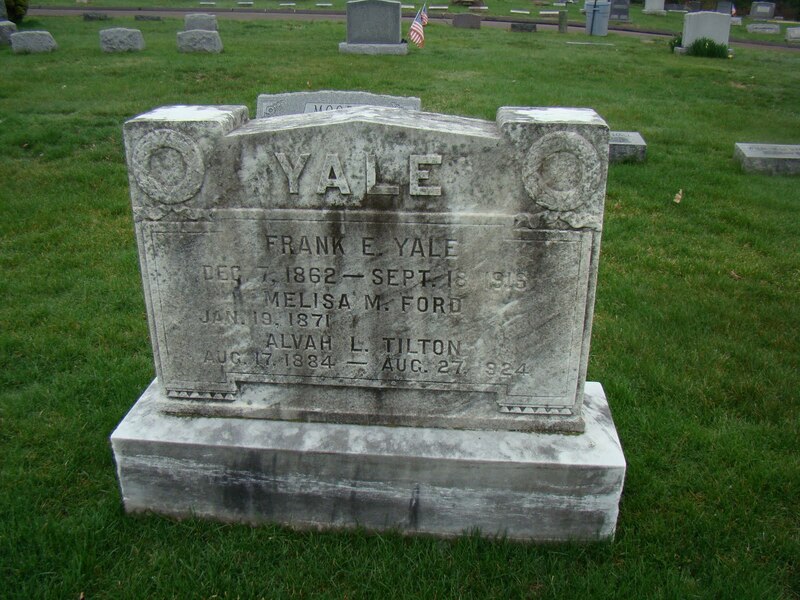 It took awhile but I did find them, actually I found first Frank Yale’s tombstone and Melisa M. Ford but she didn’t have a death date? A Tilton was buried with them? Melisa M. Ford Jan 19, 1871 to ? 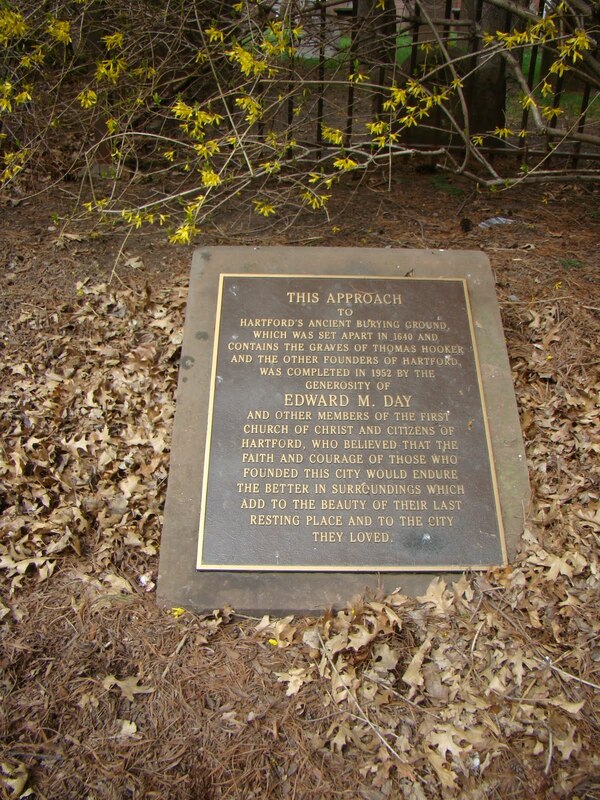 Jerome Ford and Mary J. Barclay Ford were buried over by the fence and right of road #3. It was good to see the graves. Next to them was their daughter Rozelia who died at 18 years old? In Mary’s obituary grandchildren are mentioned. If you are out there I want to meet you! Jerome B. Ford, Died July 5, 1817 Age 72 yrs. Died Mar. 28, 1917 Age 75 yrs. 3 Mos. 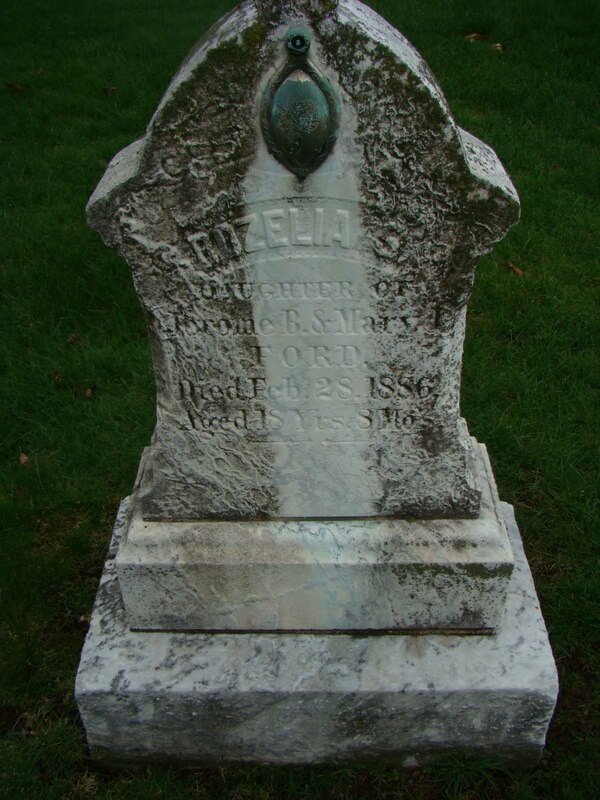 Died Feb 28, 1866 Age 18 yrs 8 mos. I finally had a picnic in a cemetery. The weather was okay, maybe a little misting? I ate my sandwich and cookies. My tenny runners were soaked and my socks were so wet it was difficult to remove them. I was getting ready to drive to Hartford when Jack stopped in his truck and asked if I needed help. That is when I proceeded to tell him about my problem with Melissa Ford and whether she was buried there. He went back to the office (near the entrance) to check to see if she was buried there but it appears she isn’t and only two are buried in this plot. I thanked Jack for caring about the records and the cemetery. He said he was learning but he was enjoying it all and liking the challenge of figuring things out about the burials. It was time to move on. It took awhile to find my way. Boy was my direction meter messed up. Anyway I found Hwy 6 and headed East. HURRAH! I had to take South Street to get to Hwy 4 because I missed my turn. I was trying to get out of the way of a red car behind me on my bumper and almost hit another car on my right in my blind spot. I felt bad. What is it about Connecticut drivers??? Why do they hang on your bumper? I did not have this problem in Massachusetts. AUGHH! I headed up Hwy 4 and found Boulevard Drive. It was lovely. The houses were lined up on both sides and were large and beautiful. All different designs. The road was smooth and pleasant to drive. It was a kick looking at the all the beautiful homes. It calmed me down. I was still pretty wired because of the day’s events. This road became Capital Ave. and I was back in the center of Hartford and driving past the State Library and I remembered it all from my first trip years back. The Capitol Dome is beautiful and gleams gold in the light. I was looking for Wethersfield Steet but it was really Main St. Turning south I ended up on Franklin but then I used Prospect to go to Wethersfield St. I was in South Hartford. 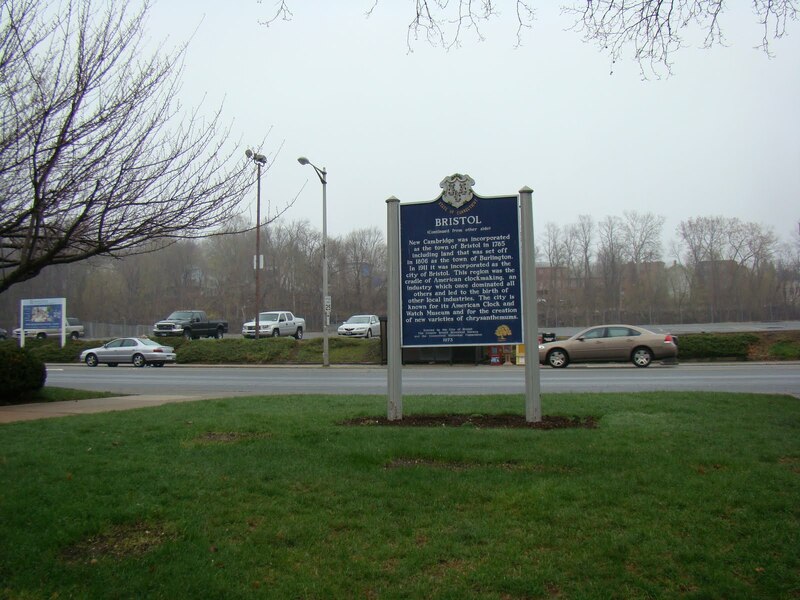 When I saw I was on Silas Dean Hwy I knew I was too far south but there was a sign to the historic district of Wethersfield and I took it. I think it was Wells Road and it became Main St in Wethersfield. 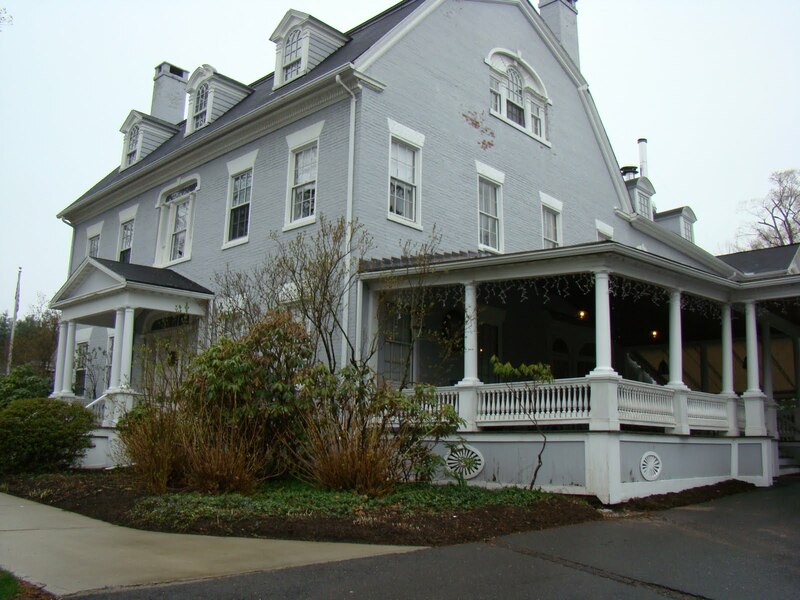 I headed north again and doubled back finding the Chester Bulkley Bed and Breakfast on the east side of the road south of the main area of Wethersfield. This area of Wethersfield is very lovely. It was like a little oasis near Hartford. I parked across from the Chester Bulkley B&B and rang the door bell. No one answered. It was about 4 pm so I was about 2 hours early. 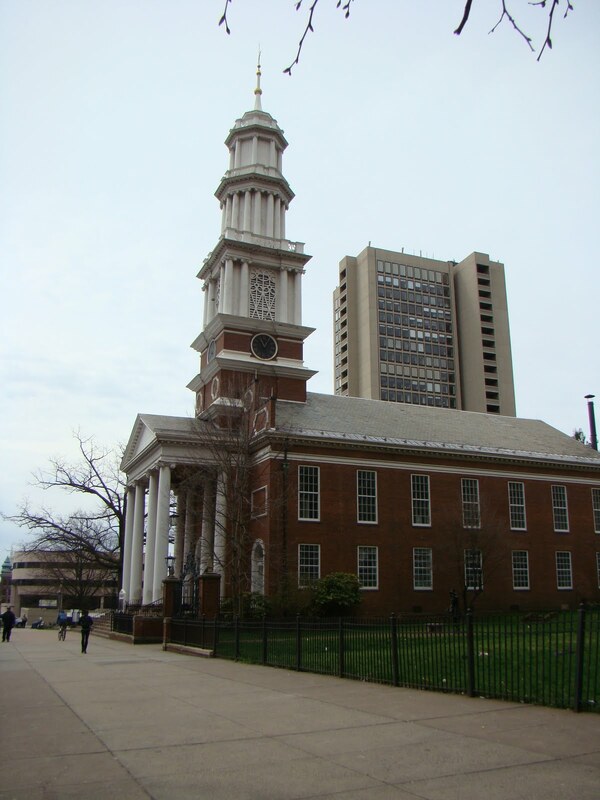 I was thinking of going to the Hartford City Hall for vital records but my experience at Bristol had made me rethink that idea. They had on their website that the records started in 1852 and that was really too late for my needs. Not worth it. I tried the doorbell again but no one answered. So I wandered down the driveway on the south side and ran into puppy dogs and the owner who was surprised to see me. The dogs were okay and she gathered them up. She offered to call the B&B for me. I turned around and wandered back to the front of the B&B and the door opened up. I was greeted by the host and entered into the foyer. He took me to my room, up some very steep stairs and down a hall way and up and over a small built up area with steps on both sides. Oh dear this was going to be hard to negotiate. The host did help me later after I had eaten. However, my room was delightful and had a little sitting area out in the hallway. Hmmm…no desk but there was Wifi. My host told me that there were several restaurants north of the B&B just a few houses up and I could walk to them. So I parked my car in the driveway in the back parking area. 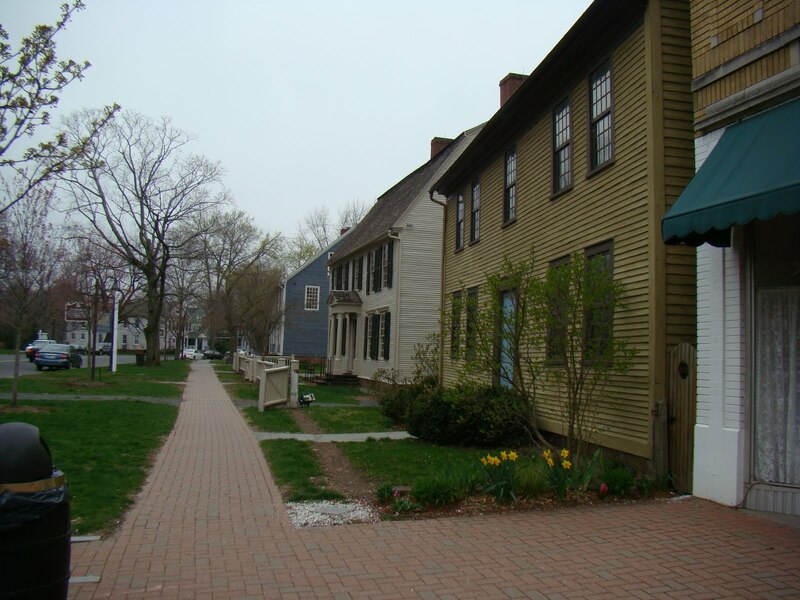 I walked south first but I saw only shops and then turned north and over to some lovely Saltbox houses on the west side of the road. I spotted other buildings that looked interesting. 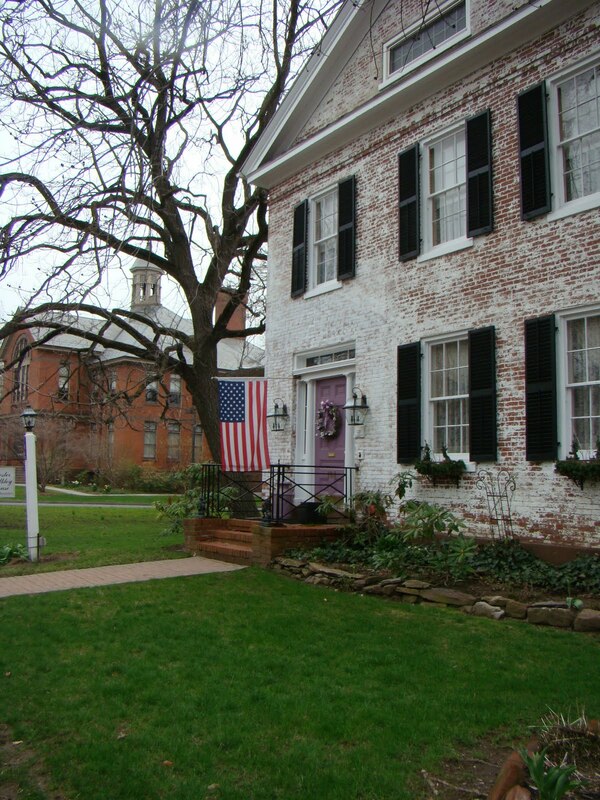 Wethersfield’s Historical District is a step back in time. 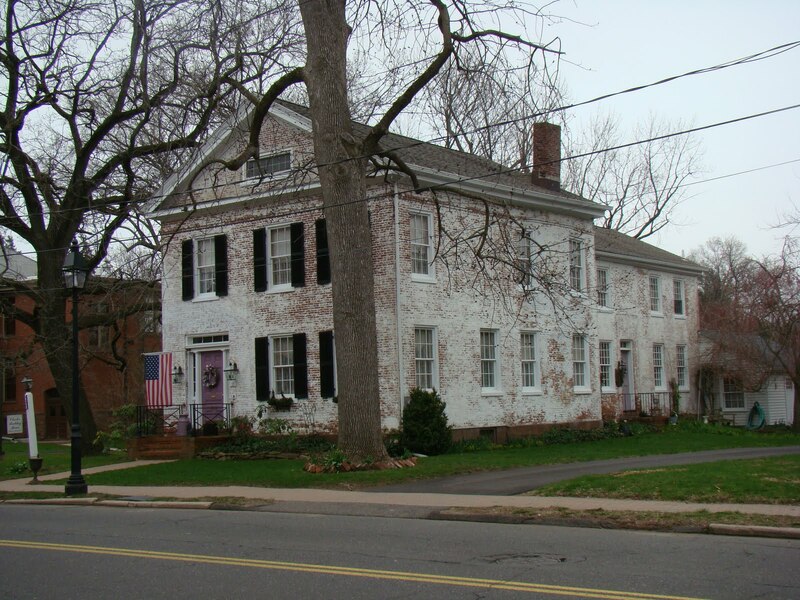 The Wethersfield Historical Society was across the street. 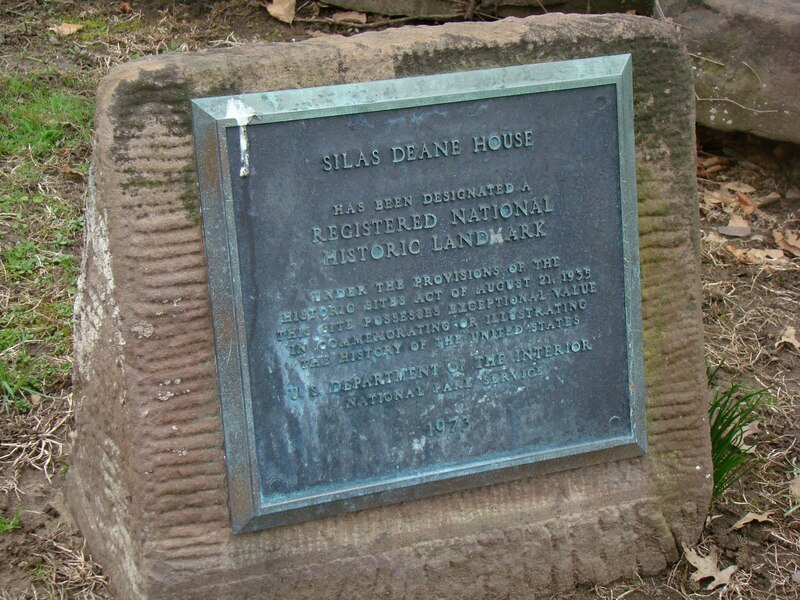 Silas Deane’s home was on the west side. 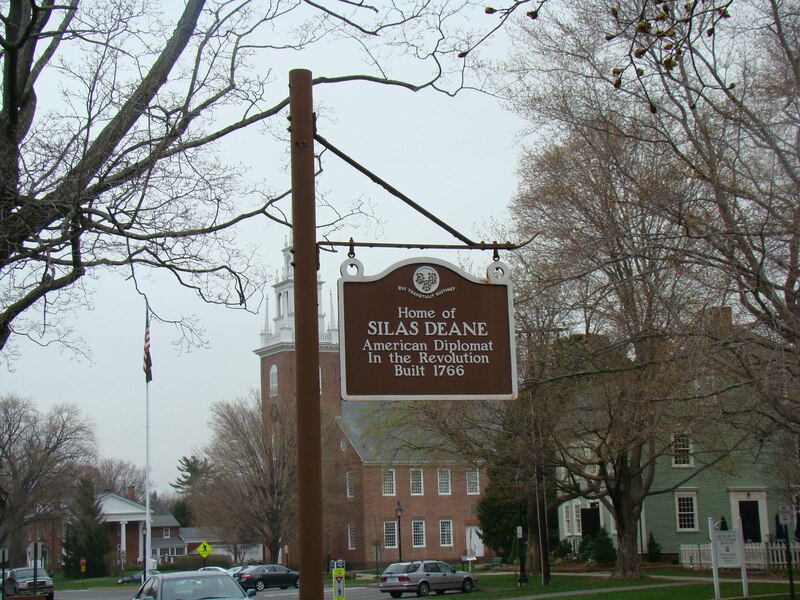 Silas Deane, why do I know that name? I picked the Village Pizza Restaurant. It was pleasant. I spotted a cemetery in the distance? My dinner was good and simple. The teenagers behind me kept kicking their seats but finally settled down. My tummy was happy! My room in the Chester Bulkeley B&B is on the second floor and I have a little sitting area with a TV. I miss my Dish!!! My hubbie is probably having fun watching what he wants. I did find NCIS but it is not my favorite. I found Criminal Minds. So I am content. The sun finally came out and I could smell Spring in the air. 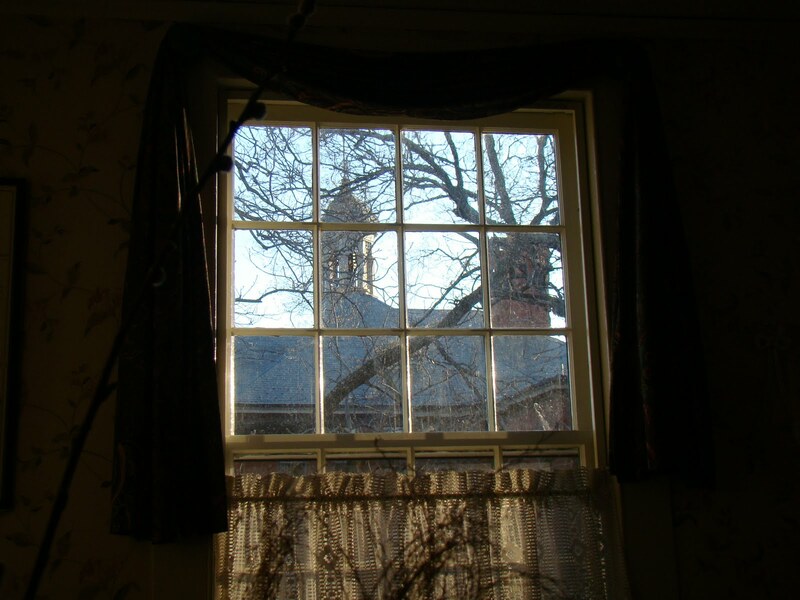 I have a window and I watched the sun go down in Wethersfield over the spires of the building north of the B&B. So I was having trouble posting. Note: B logspot started to give me error messages and would not accept by edits.